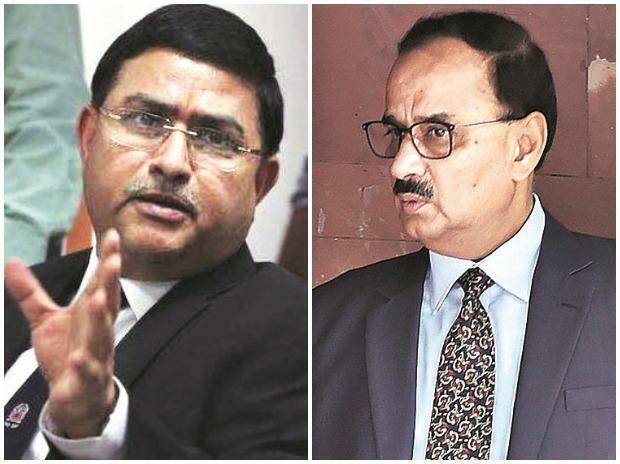 Bitter feud between CBI Director Alok Verma and Special Director Rakesh Asthana resurfaced Friday in the Delhi High Court when Asthana claimed that prior government nod was needed for lodging FIR against him and DSP Devender Kumar in a graft case, a submission which was vehemently denied by his senior. In response to Asthana's plea challenging the FIR, Verma said in his affidavit that Additional Solicitor General (ASG) P S Narasimha's view was sought by the CBI on the need for prior government approval to lodge an FIR against public servants facing allegations of corruption and he had opined that it was not required. Asthana's submission before Justice Najmi Waziri was countered by CBI, Verma and Joint Director A K Sharma who argued that no sanction was required as the allegations against the two officers were not in relation to the discharge of their duties or any recommendation made or decision taken by them. Senior advocates Amarendra Sharan and Dayan Krishnan, appearing for Asthana and Kumar respectively, told the court that the Central Vigilance Commission (CVC) had sent two communications in October this year to CBI asking it not to register an FIR or take action against the two officers without prior approval. They argued that section 17A of the Prevention of Corruption Act makes it mandatory ta hat prior approval has to be taken before lodging an FIR or initiating preliminary enquiry against a public servant. "It was deliberately and knowingly given a go-bye," they argued and urged the court to call for the files, including the case diaries, to ascertain the reason for this step. "He cannot on his own decide not to invoke 17A. He has to record reasons why it was not applicable," Krishnan argued. The court asked the CBI about the effect of such a CVC communication to take prior approval. "Assuming there is a direction like that, what would be your stand? Will it stay your hands," the court asked to which Additional Solicitor General (ASG) Vikramjit Banerjee, appearing for CBI, said he will need to go through the communications before answering. Kumar, earlier the investigating officer (IO) in a case involving meat exporter Moin Qureshi, was arrested on the allegations of forgery in recording the statement of Satish Babu Sana who had alleged to have paid bribe to get relief in the case. He made allegations of corruption, extortion, high handedness and serious malpractices against Asthana. The court asked CBI, as to how Sana -- on whose complaint the FIR was lodged -- met with another officer of the agency and went to a District Court here to record his statement before a magistrate in connection with the allegations he had made, when the IO was Kumar. Banerjee said that Sana's complaint was directly made to Verma and proper procedure was followed by the agency before lodging an FIR. He also said that section 17A of PC Act would not apply as the allegations against Asthana and Kumar were not in relation to discharge of their official duties. However, this was opposed by senior advocate Sharan, who said that since Asthana had already written to the Cabinet and the CVC against Verma, the action taken against him was in relation to discharge of his official duties. Verma, in his affidavit, also said the ASG had "opined that there is no need for obtaining any sanction or approval of competent authority under section 17A of Prevention of Corruption (PC) Act if an enquiry or investigation has already commenced on the date section 17A came into force". It also said that the ASG had "advised that whenever a cognizable offence comes to the notice of law enforcement agency, the FIR or preliminary enquiry (PE) must be registered and it should not await prior approval under section 17A". The contention was supported by Additional Superintendent of Police S S Gurm, represented by advocate Sunil Fernandes, who said that prior to lodging of the FIR, ASG Narasimha's view was taken. However, they could not tell the court when the view was taken and sought time to verify it from the records. Joint Director Sharma, meanwhile, handed over to the CBI a sealed envelope purportedly containing "vital information" relating to the case. Sharma's lawyer said he would file the same in a sealed cover in court also. Apart from that, the advocate argued that Asthana and Kumar's pleas were "replete" with "unsubstantiated allegations" against him of having accepted illegal gratification to the tune of Rs 2 crore. Fernandes, seeking impleadment of his client in the matter, said the "tepid" manner in which CBI was defending its decision supports his apprehension that the agency was not properly pursuing the case. The court, however, did not appreciate the argument. It said arguments will continue on December 14 and that it will call for the case files if required. The court also extended till the next date its interim order directing CBI to maintain status quo regarding proceedings against Asthana. Kumar is out on bail at present. It also took on record Verma's affidavit which said there was sufficient incriminating documents and evidence against all accused -- Asthana, Kumar and middleman Manoj Prasad -- with CBI and FIR was lodged after the PE disclosed cognizable offences. It claimed that Asthana's plea is misconceived, premature and not maintainable as investigation in the matter is at a nascent stage. The Supreme Court on Thursday had reserved judgement on Verma's plea, challenging the Centre's decision to divest him of all powers and sending him on leave.